X-Force returns to Earth with Cable's stuff in tow. As Graymalkin breaks up, Lila Cheney teleports Iron Man & the SHIELD force back to their shuttle and the rest of X-Force to Camp Verde, while Cannonball & Sunspot head back to Earth aboard an escape pod Professor managed to get them into before the station exploded. 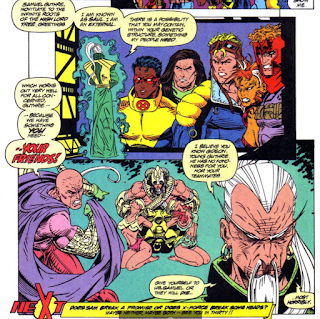 Elsewhere, the captive Boomer, Warpath & Siryn learn they've been captured by Gideon & the Externals. 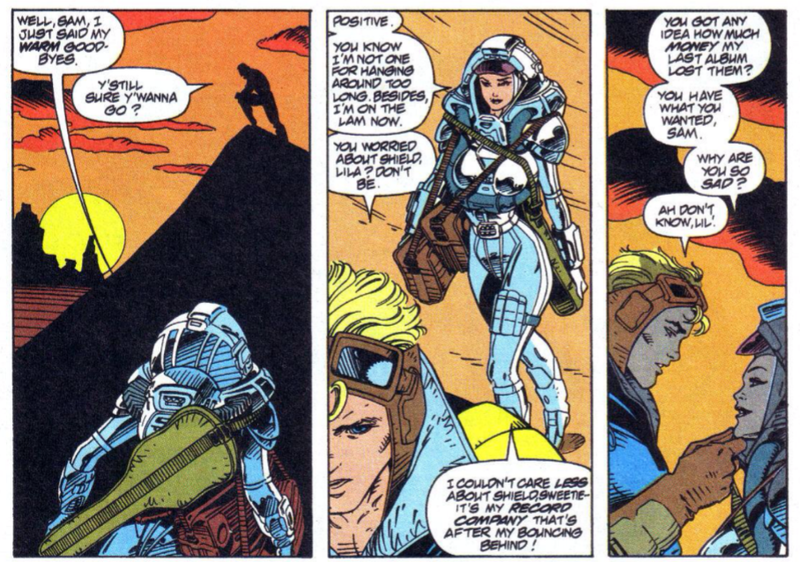 At Camp Verde, Cannonball & Sunspot touch down, and while they can't preserve Professor's programming, all of Cable's gear, jettisoned from Graymalkin, lands shortly thereafter. In Canada, Domino, Grizzly & Hammer break into Department K searching for info on Cable, only to be confronted by the new Weapon: Prime team. In Boston, Deadpool attacks Vanessa and her roommate, and Deadpool's associate Sluggo kills one of them. In Arizona, X-Force is inventorying the equipment they received from Graymalkin when they are contacted by the Externals, who declare that if Cannonball doesn't turn himself over to them, they will kill his captured teammates. 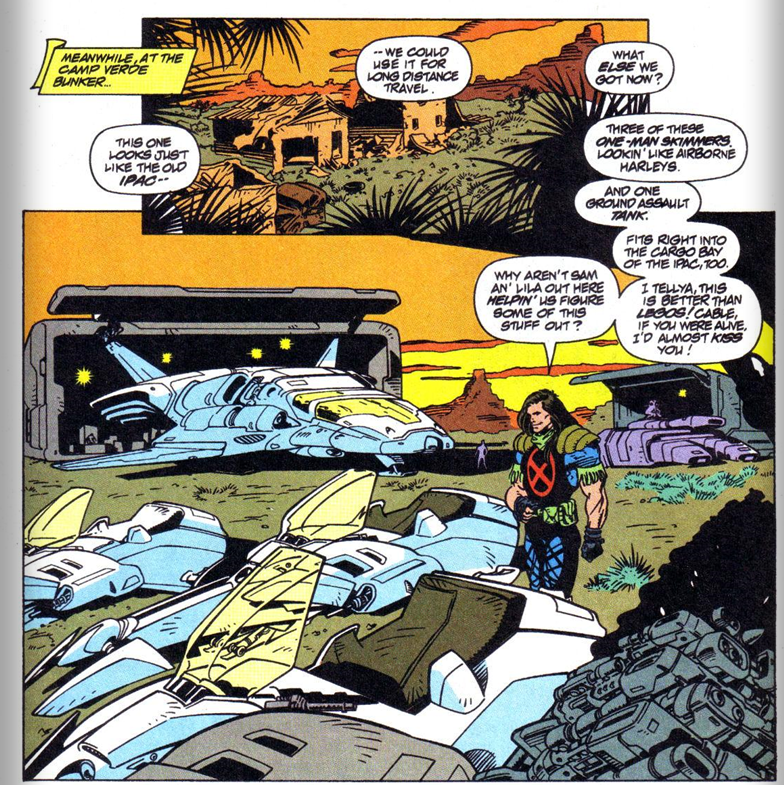 The various components of Graymalkin jettisoned by Cannonball & Sunspot last issue touch down at X-Force's base here, leaving X-Force with access to all of Cable's stuff, and ensuring they'll have plenty of sci-fi tech moving forward. 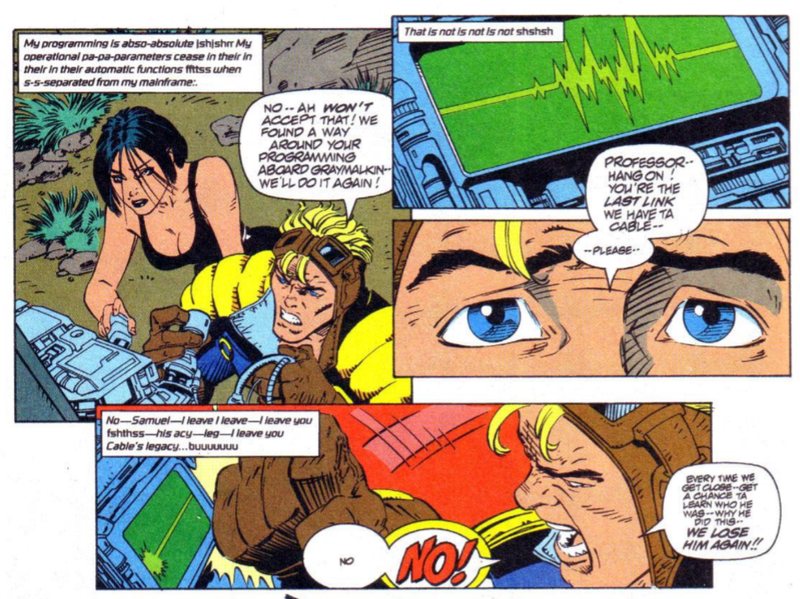 However, they lose access to Professor, who is programmed to shut down once the escape pod containing Cannonball & Sunspot touches down, but this won't be the last we see of the character (in as much as we can "see" a character which is a disembodied computer voice). In the Domino/Grizzly subplot, a new iteration of Weapon: Prime debuts, bringing back such stalwarts as Tygerstryke, Yeti, and Killjoy. 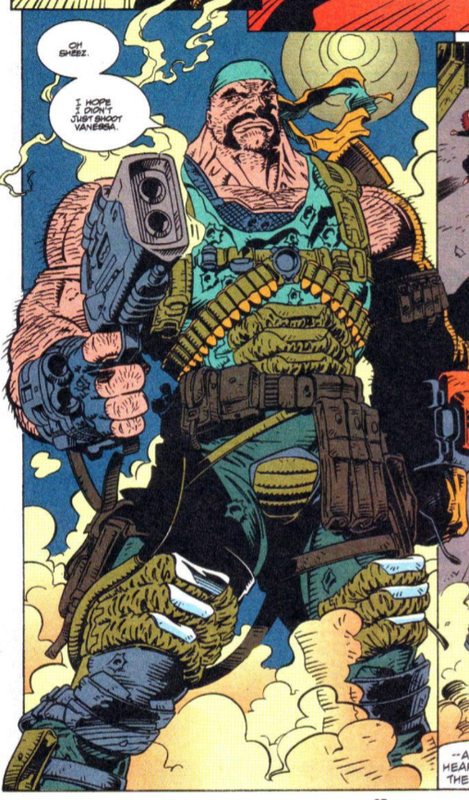 And in the Vanessa/Deadpool subplot, Vanessa's roommate is killed, and we're introduced to Sluggo, who will recur as a minor Deadpool supporting character and is basically a big guy with guns. There is also mention of Tolliver's will, which will form the narrative spine of Deadpool's upcoming limited series. This is quite possibly the series' most 90s cover yet, which for this series, is saying something. For what it's worth, the narration captions at the start of this issue are back to referring to Jim Rhodes as "Iron Man". The "Graymalkin represents Sam's grief over Cable" metaphor runs its course, as Cannonball is desperate to save Professor so as not to lose Cable all over again. It's once again suggested that Vanessa's shapeshifting power is out of her control, and that she shifts to mimic the appearance of someone physically close to her, after which she's "locked in" to that form for some unknown length of time. Lila leaves Earth this issue, saying her record label is pissed at her for the poor sales of her last album, thus eliminating X-Force's ability to teleport anywhere they want (which, of course, is less necessary now that they have a hanger full of space age Cable vehicles to use). The final panel depicts the captured Boomer, Warpath and Siryn in a pretty unnecessarily cheesecake-y way. 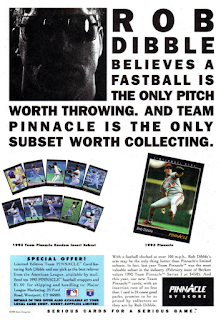 This baseball card ad cites the value, on the collectible market, of a previous set of cards per Beckett magazine. Which may also be the most 90s thing ever. Remember Beckett? Remember Rob Dibble? With "Cable Grams" adopted as the name of the letters page in Cable, X-Force's page is renamed "Exclamations" this issue. Just as he did with the Classic Claremont Quiet issue riff in X-Men #20, here Nicieza is taking another page out of Claremont's playbook, the rolling storylines. 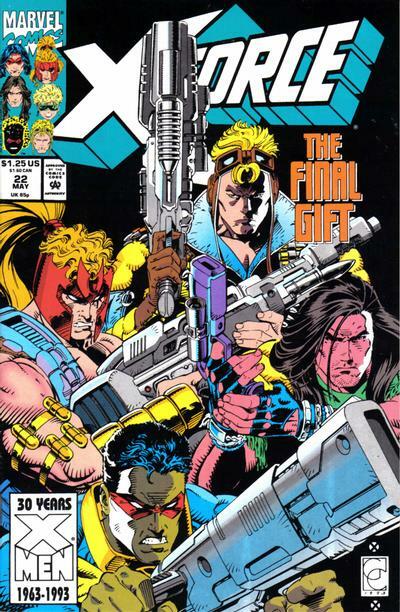 This issue both ends the "X-Force battles SHIELD & Iron Man on Graymalkin/Cannonball grapples with Cable's legacy" storyline and shifts the External's attack on the team from subplot to A-plot, setting up a more direct confrontation between the two groups for the next issue. Along the way, he also advances the Domino/Grizzly subplot and the Deadpool/Vanessa one (which is also as much a setup for the Deadpool mini as future X-Force issues). The result is a run of issues that harken back to some of Claremont's best runs, in terms of structure, in which the emphasis is placed on ongoing narratives rather than finite, clearly-defined story arcs. It's an approach both Niceiza and Scott Lobdell have (and will continue to) embrace in the wake of the now-annual linewide crossovers' ascendancy, an approach that helps keep each book from feeling like its just biding time between big events. It's also responsible for much of this series' post-Liefeld surge in quality, as each issue reads more and more like an installment in an actual ongoing narrative and less like a thin pretense for Liefeld pinups. Tomorrow, Excalibur fights the RCX in Excalibur #65. Next week, Uncanny X-Men #301 and X-Factor #91. "The result is a run of issues that harken back to some of Claremont's best runs, in terms of structure, in which the emphasis is placed on ongoing narratives rather than finite, clearly-defined story arcs." Good analysis, and with that sentence you nailed precisely why I have little interest in Marvel comics these days. Everything now (and for quite some time) is a story arc. "Rolling plots" are a thing of the past; everything is just a series of multi-part arcs with their own sub-plots and their own "beginning-middle-end" structure, like a movie. That style of storytelling in an ongoing, serialized comic just doesn't appeal to me at all. I much prefer ongoing sub-plots that last beyond single arcs, and plots that come and go, bleeding and overlapping one into the next, rather than being confined to an arc structure. I do, but mainly from THE BEST DAMN SPORTS SHOW rather than his playing career. 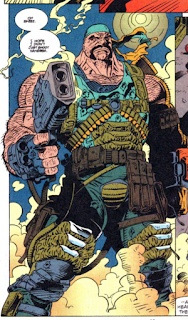 The funny thing about Cable's "legacy" is, save using some of the vehicles here and there...X-Force didn't use it. And why the hell did a team of superhumans that could destroy a city in no time, with several that could fly, need all of this equipment for? Guess they could drive the tank to a nearby city to buy groceries. It shouldn't surprise anyone who read superhero comics back then that none of these thoughts occurred to me at the time. It just seemed COOL. I figured it had more to do with them not wanting Cable's future tech to fall into the wrong hands. In this case the US government. Hmm. While definitely uneven, Capullo’s art is overall much cleaner and more open than I’d have expected from the period — given that the first time I recall having seen his stuff was the Angela miniseries and attendant Spawn work — reminding me of Rick Leonardi and even P. Craig Russell in places here.